Bullet For My Valentine are slowly but surely gaining popularity to overtake Lostprophet's position as the number one band from Wales, at least if you judge on how long the line to the sold out Astoria was half an hour before the doors, and the anxious "Bullet! Bullet!" chants of the people half way down the line. I understand perfectly well why these people were so excited - Bullet For My Valentine is one of the best UK bands around at the moment, and their recently released debut album "The Poison" is a definite candidate for the album of the year award. The length of the line had exceeded all of my expectations, and thus I wasn't able to get in, in time for Hondo McLean's and Scary Kids Scaring Kids' sets; Candiria was almost done setting up as I entered the venue, and it didn't take long before they launched into their set. Without knowing anything else of the band than their name, I had no idea what they would sound like. And today, two days after their concert, I still don't have an idea of what they sounded like. I have never ever ever heard worse sound quality than during their set. It was like trying to listen to a guitar-driven Led Zeppelin song on your iPod while sitting next to a guy utilizing a pneumatic drill on the asphalt. The only difference here was that the drilling sound was replaced by bass guitar and drums, resulting in a messier sound than a 1 year old's shirt after breakfast. I could swear to God the band only consisted of a bassist, a singer and a drummer. On top of that, Carley Coma, their vocalist, was straight from your stereotypical hip-hop show. He bounced up and down, side to side on the stage as if he was on a trampoline, and kept on shouting to the crowd "Up, Up, Up, Up" in a style not much different from todays rap stars. Personally, I found their set too messy to be able to enjoy about it. But the guys at the pits were loving it, judging by an unusual amount of circle pits during a support act. "THIS IS WAR" was the crowd-energizer line used by Carley throughout their set, and he genuinely wanted to see the floor to become a battlezone tonight. But for me, their set was destroyed by the horrible sound quality. Just as expected, "Intro" served the exact job of its name by being on the background as the band entered the stage, with Matt Tuck, the lead vocalist, slightly delayed in order to break straight into "Her Voice Resides"'s riffs, though without the introducing scream. Fortunately, the sound quality was a thousand times better than earlier, and it was actually possible to hear their trademark creative riffs just as they were meant to be heard. 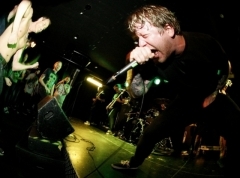 The heart-scraping screams of "Spit You Out" were greeted with much enthusiasm by the crowd, but it wasn't until the two singles "Suffocating Under The Words Of Sorrow" and "4 Words (To Choke Upon) before their set really got some air under its wings. But by the time the band was half way through "Tears Don't Fall", arguably the best song on their debut, a strange, bewildering thought entered my mind: WHY DIDN'T HALF OF THE CROWD IN THE PITS KNOW THE LYRICS TO THE CHORUS OF THE BEST SONG THE BAND HAS EVER WRITTEN? Specially because the chorus is one of the catchiest and most aggressive ones on the album, with meaningful screams to catch the attention of anyone listening nearby. So I sat down and started analyzing it a little bit, and I came into the horrible conclusion that our beloved Bullet For My Valentine is becoming a 'hip' band to like. To explain further; a frightening portion of the fans only knew the lyrics to the songs currently receiving airplay on the radios. And when Matt tried to make the crowd sing along to some verse parts of "10 Years Today", the venue was surprisingly quiet, taking into account the enthusiasm presented on the line to the venue earlier. It became obvious that the band was a little bit bummed out over this surprising fact, and the band never reached the same intensity as in their previous headlining show in London, a few months after the release of their critically acclaimed EP "Hand Of Blood". My thoughts were only confirmed when the band entered into the old songs like "No Control" and "Just Another Star". As I looked around me while singing and dancing along to these great songs, I found I was in the minority of the crowd knowing their lyrics to either one of the songs. I miss the days when the band was known by few, but loved to death by those who did. But onto some positive things now: The biggest + factor for me was the different interpretations of "Tears Don't Fall" and "Cries In Vain". The former's guitar-solos were twice as fast as on the record, resulting in twice as many chills down my back, and "Cries In Vain" was a marathon version of the original, with the ending repeated twice after applauds from the crowd. I can't help but compare it to that amazing concert the band gave last February.. and against that one, together with the crowd's negligence of other songs besides for the singles, this one by no means matches the experience in Mean Fiddler on Valentines Day.